ilanarama | what kind of an idiot goes hiking in the desert in August? Oh, right. That would be ME. what kind of an idiot goes hiking in the desert in August? Oh, right. That would be ME. Thursday night was the peak of the Perseid meteor shower, so Britt and I had plans to drive out to Cedar Mesa in Utah, figuring it would be warm enough there to sleep out and look at the sky, as well as clear (rain was predicted for Durango) and dark (the nearest town being Mexican Hat, population 88). And it didn't really make sense to drive out around 3 hours just to spend one night and drive back in the morning, so at the last minute we decided to bring our gear and go backpacking on the Fish Creek/Owl Creek loop, a highly-rated hike that goes through scenic canyons with arches and ruins, with quite a bit of rock scrambling and route-finding required. Most people, of course, do this in the spring or fall, when it's not brain-scorchingly HOT. 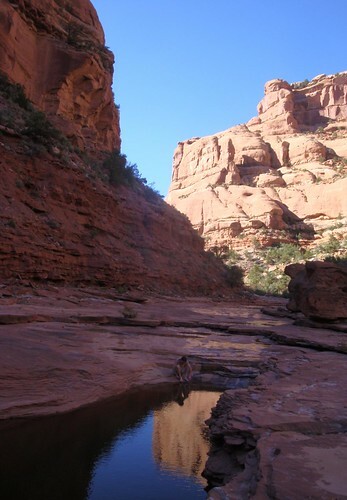 On the other hand, it had rained across the entire region the previous week, so the intermittent streams would be running and the pools would be full, and with predicted temperatures in the upper 80s to lower 90s it was still on the cool side. (For the desert. In August.) Best of all, we would have it to ourselves - because nobody else would be nuts enough to be there. 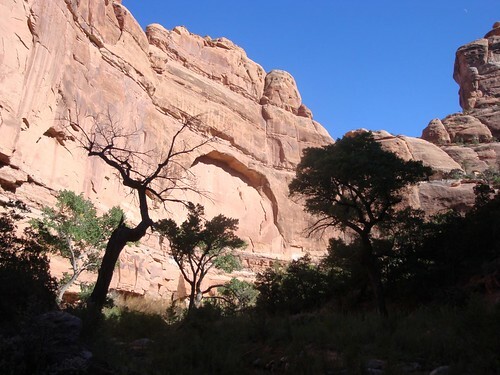 In the morning we drove up the Moki Dugway - a ridiculously steep and curvy road cut into the south cliff of Cedar Mesa - and north to the trailhead. According to the register we were the first people through in three days, and the others were BLM rangers or dayhikers. 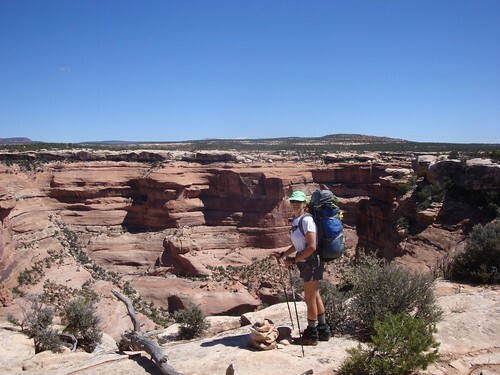 We got our gear together, signed the register and started across the mesa toward the rim of Fish Canyon. This is the opposite direction most people do this loop - according to the sign at the trailhead and one of our guidebooks, it's recommended to go down Owl and up Fish - but our other guidebook recommended the opposite direction, and that's what Britt had done on his previous trip through (with a friend, not me - I must have been out of town). Once at the rim, it was time to head down. 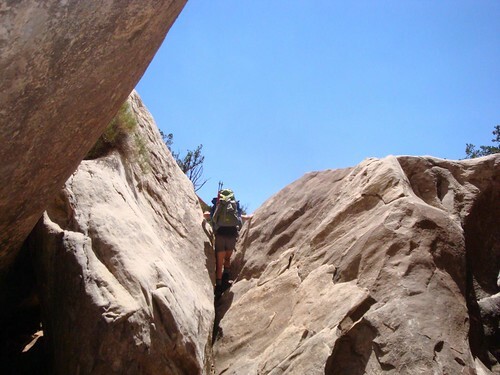 This was easier said than done, and one of the reasons the opposite direction is recommended, as downclimbing is harder than ascending, and the descent begins with a 15-foot crack. It actually wasn't that bad - almost like stair steps - but I did have to remove my pack and hand it down to Britt, who had gone first. 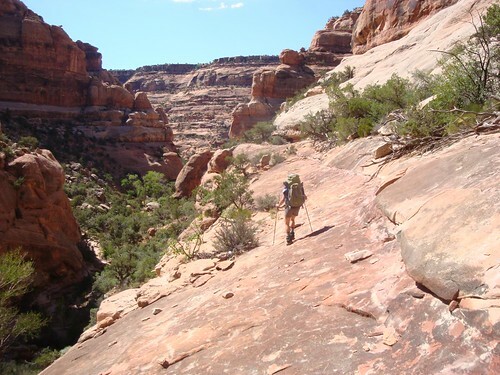 Then it was a matter of following the cairns (when they were present) or discerning the easiest-looking route (when they were not) across shelves, down slickrock, around boulders, and sometimes even along segments of actual trail, until we reached the bottom of the canyon. The hike did not become appreciably easier at this point, despite the more gentle descent. The earlier rains had caused flash floods which had wiped out much of the trail, knocking over cairns and flattening plants across the pathways. It wasn't always clear where we needed to stay high to skirt an obstacle, and where it was best to stick close to the creek, and where we had to fight through the thickets of vegetation (which at least were usually flattened in the direction we were going). 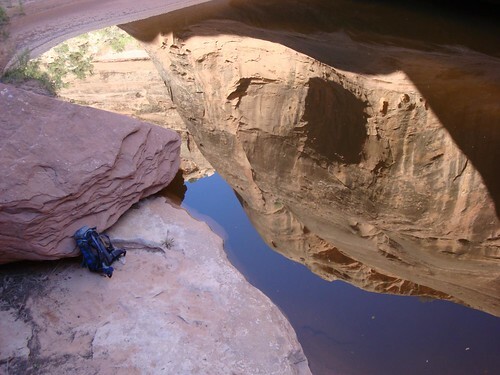 It was easiest when the creek ran over bedrock sandstone; then it was like a paved sidewalk. And set in the sidewalk were wonderful pools! 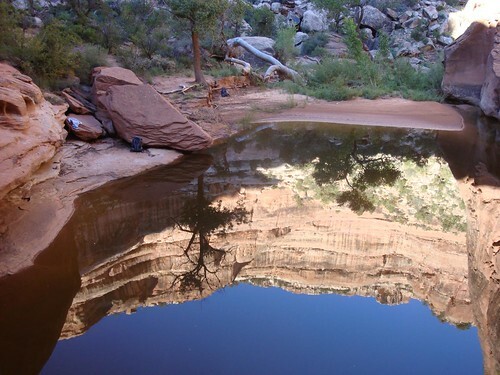 We broke our hike several times to swim and cool off, and made camp in the evening at a particularly beautiful pool where we first filtered water for drinking and cooking, then took a swim. With the sun behind the rim the temperature was exceptionally pleasant. We slept out in the open again, and although the visible sky was reduced by the canyon walls we still saw a few meteors. We woke fairly early the next morning so as to get some hiking in before it got too hot. We continued down Fish Creek, keeping a sharp eye on the stream, which by now was intermittent, occasionally flowing and occasionally underground. About a mile from the confluence with Owl Creek, the water had dwindled to small sporadic pools, so we stopped to filter water to top off our supply and then dunk ourselves to cool off. 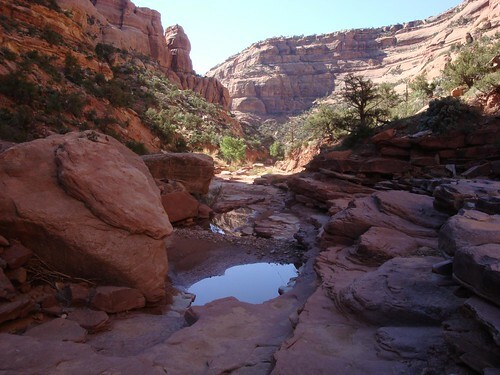 It would be a long and hot hike to the next water source, four miles or so up Owl Creek. And it was, hot and dry and tiring. The usual advice is to hole up during the hottest part of the afternoon and resume hiking after 5pm or so, but there wasn't anywhere nice and shady to hole up, so we kept going. 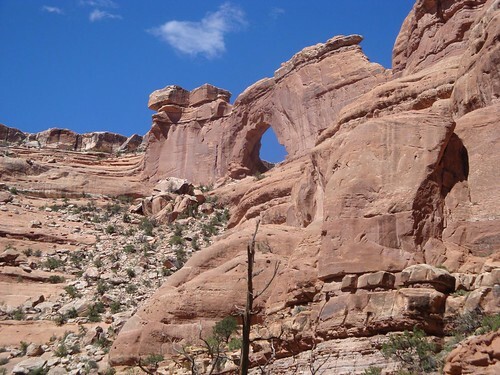 We did rest in the shade every time we found some, and at least the scenery was distracting - pillars and monuments and eventually, the beautiful and dramatic Nevills Arch. 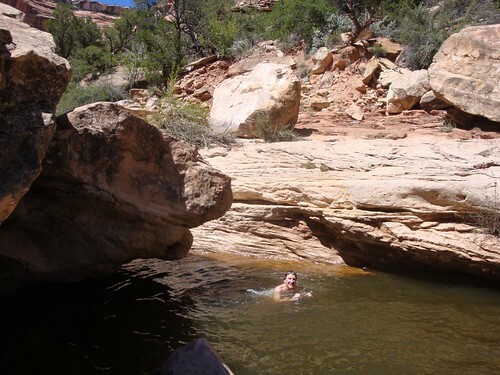 Britt had remembered a beautiful big pool under a pourover (dry waterfall) and so we pushed on in order to camp there. It was amazing! The near shore was sandy dirt, but by squeezing through a crevice between two boulders, we accessed a tiny shelf of sandstone, just big enough for us to lay out our tarp and sleeping bags and set our chairs and stove for a camp. We cooled off with a swim, and then ate dinner and watched half a dozen bats swooping erratically back and forth across the pool, catching their own dinner of bugs. We swam again in the morning, then packed up and headed out - and up. 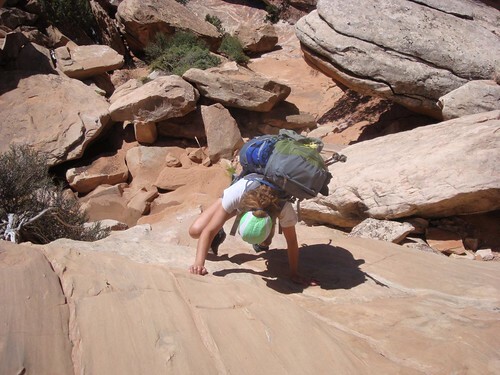 To bypass the pour-over, the route makes a few tough climbs and obscure detours, and we probably didn't find the optimal way, but we found some way, and followed it up to the next slickrock level. 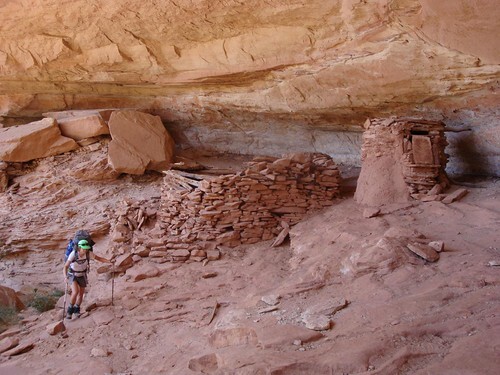 Then it was bushwhacking again, back and forth between overgrown stream banks and rock jumbles, until we emerged onto a sandstone slope marked with cairns that led to an alcove, under which were four pre-Puebloan structures and some pictographs. We took a break there, poking around the ruins, and then tried and failed to find a marked route out - so we climbed up a crack at the edge of the alcove and scrambled out onto another rock slope. This one led us up to a wash at the top of the canyon, and suddenly - hey, was that the white roof of our camper van? We were back at the trailhead! As always, I enjoy living vicariously through your incredible pics! This looks like great fun. . . It was really something. 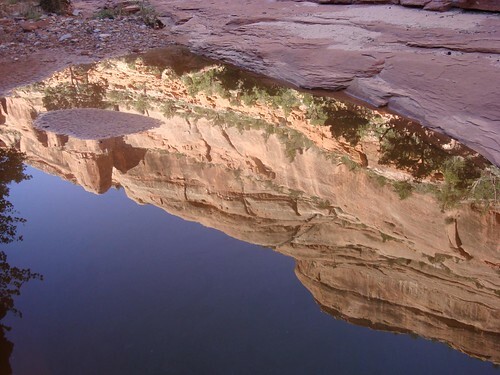 A fabulous place, and if you haven't been there, Natural Bridges NM, Canyonlands NP, and Arches NP would make a great family vacation. It isn't all scary rock scrambling! BT, DT. And that was the Leonids, in November, which I think it is too cold even in Utah to lie out watching. It was pretty awesome, though, I remember, lounging on the deck anchored on the uninhabited side of a barely-inhabited isle. Damn it, now I want to be on a boat again! Hehehe, I was anchored off of Norman Island, BVI that very night! Great stargazing. I just love reading about your adventures. When I was a kid my grandparents lived in Tucson, so we spent a LOT of Augusts in redrock country. And yeah, it's hot, but, well, enh. Looks like you had water, too, so that's not so bad. Yeah, the water helped. We swam three times each of the first two days, and once on the last day. And we drank huge amounts and still felt dehydrated! I think part of it is that it's so arid that the shade feels infinitely cooler, and with towering walls there was often shade. Looks amazing!!! Such gorgeous scenery. It's such a nifty place. Another great adventure. Thanks for sharing! Yeah, you can't really see the sky even in suburbia, what with streetlighting. The big constellations are pretty much it. So it's always a bit of a shock to get out in the wilderness and see what the sky really looks like! Oh, my goodness! What amazing country and what fantastic campsites! 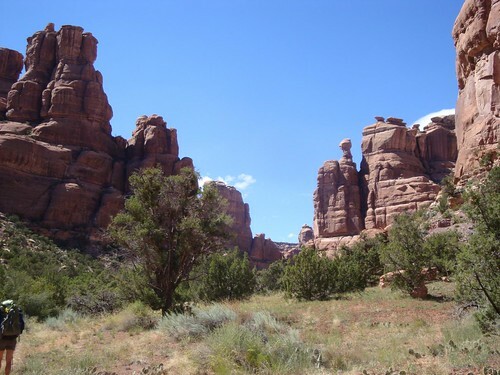 I love living so close to the Utah canyonlands! I love that cliff with what looks like a blind arch carved into it (I can see it's natural, but don't know how better to describe it).